Glengall Wharf is now a thriving communal garden growing fruit and vegetables. It replaces the refuse wharf at the end of the Surrey Canal Walk where the main arm of the canal opened out into a junction known as Glengall Basin, wide enough for barges to turn down to Peckham. The Peckham branch of the canal opened in 1826, 15 years after the main section from Surrey Docks to Camberwell Road. 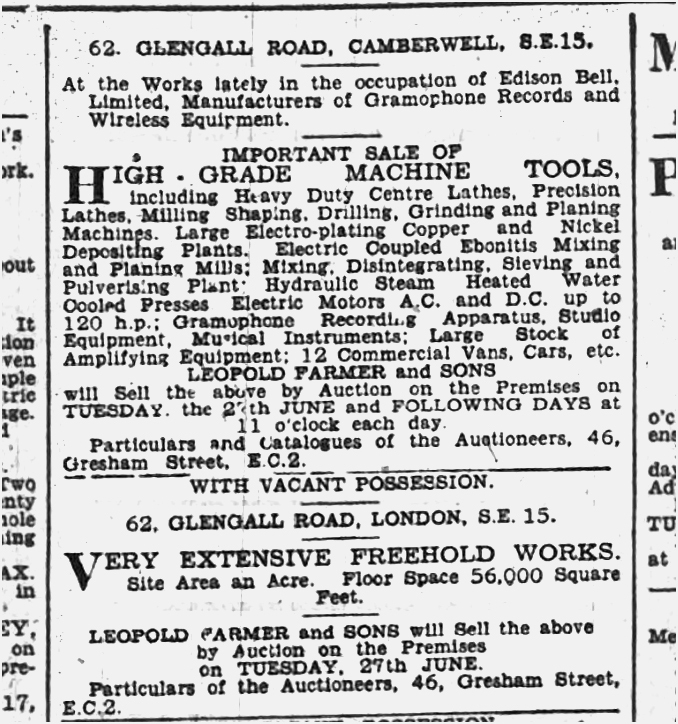 Opposite the Wharf, the Edison Bell works produced early records and gramophones. The concrete wall, which formed the edge of the canal as it rounded the bend, is still clearly visible*. This supported Glengall Wharf, which in later years was a Camberwell Council depot, used for tipping refuse into barges. There was a toll ‘hatch’ (gateway across the towpath) opposite, near Trafalgar Bridge, to collect fees from barges going down to Peckham. 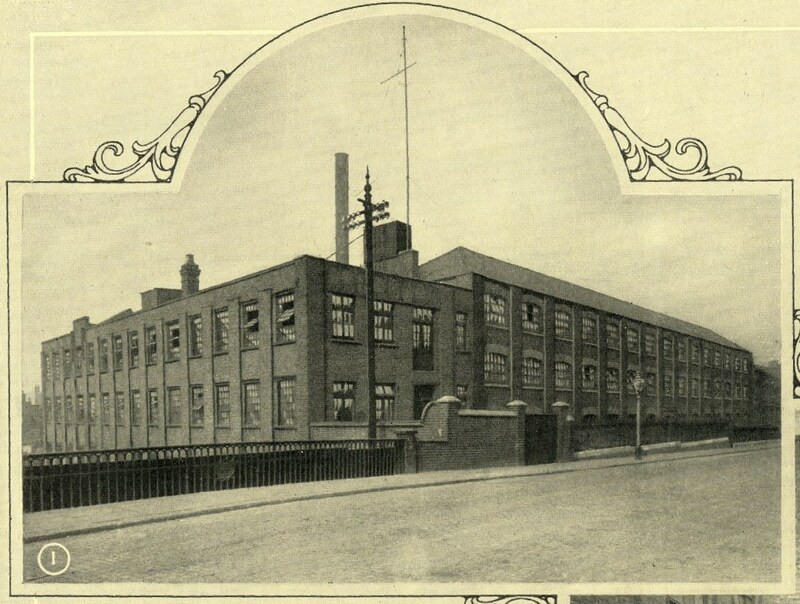 On the north bank of the main canal, occupying what had been a gas meter factory at the start of the 20th Century, was the main works of the Edison Bell company. Thomas Edison was the great American inventor and businessman who pioneered the first commercial recorded music. 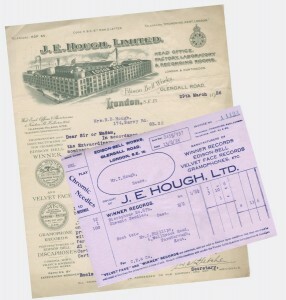 Here, to start with, they made recording cylinders, and later 78rpm records, at one time producing as many as 6 million a year. They recorded many artists in their studio on the top floor, including famous African American world champion heavyweight boxer Jack Johnson, who came here on 30th June, 1914 to record a talk on fitness. Find out more about Jack Johnson in this BBC Programme from 2011. His Peckham recording is at 6:39 into the progamme. Note that he didn’t really speak in a ‘cumbersome’ way as discussed here – this transfer from disk is slightly slow. The factory was given over to war work during WW1, and later produced record players – ‘gramophones’ – and early radios – ‘crystal sets’. 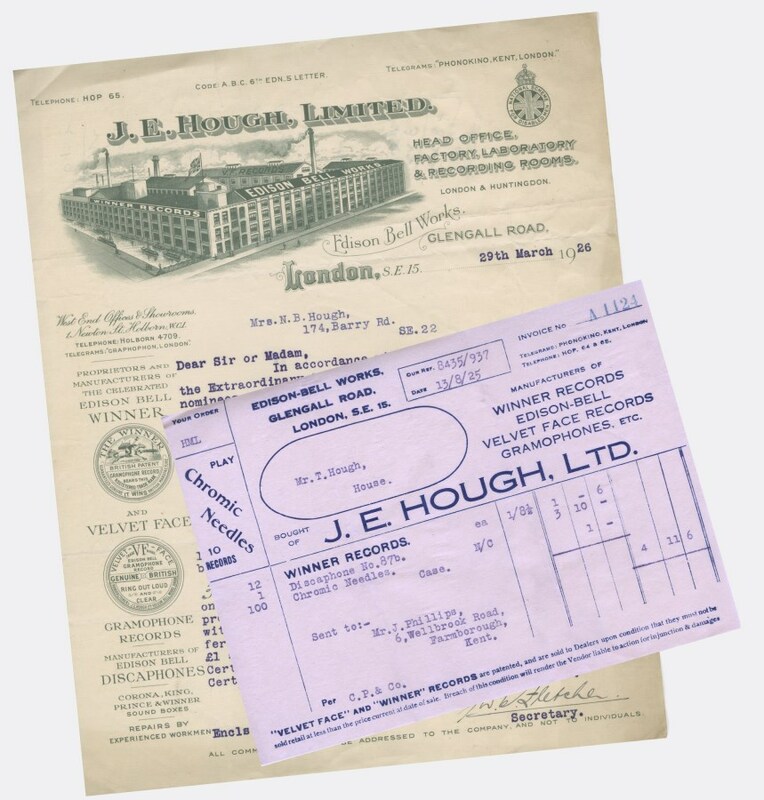 However, following financial troubles, they closed in 1933, and the building was taken over by Buckingham and Co, to become a bedstead factory. There’s nothing to see now of this large complex of buildings at 62 Glengall Rd. 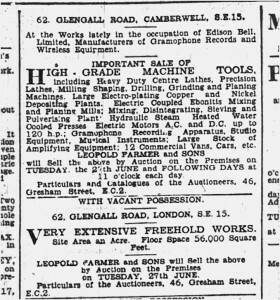 The Peckham canal branch was home to various warehouses for building materials, but particularly timber yards. Timber was a speciality of the Surrey Commercial Docks, situated at the Thames end of the canal at Rotherhithe, and there were many timber yards along the whole length of the canal. Whitten’s Timber (at the Peckham end of this branch) is the sole historic survivor of this trade. The former refuse depot here at Glengall Wharf is now home to the Burgess Park Food Project – communal gardens growing fruit, vegetables and flowers. Much of the refuse from the yard sailed on the barges to Medway towns such as Sittingbourne, where it was tipped into the sea or used to make bricks, which may well have returned right here on the same barges, to build the streets of Camberwell and Peckham! Listen to people’s memories of the many different industries in the park.